One of the jobs we enjoy the most at Aqua Garage Services is welding and fabrication. 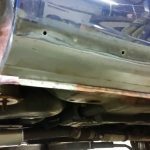 In this case, we fabricated and welded the sill and chassis area on a Nissan 200sx S14a. All sill and chassis repair panels were manufactured in house.